For whatever type of exercise you are involved in, you need to have a trusty source of energy to keep you fueled all day. FA Nutrition presents a fast-absorbing and long-lasting source of energy just for you... say hello to Carborade! 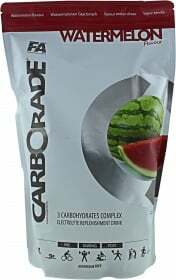 Carborade combines three carbohydrates that will serve as your source of energy for your exercise and day-to-day activities. This carb-based powder drink is all about keeping your energy levels high before and during exercise, and replenishing depleted energy reserves after your training. Carborade contains Fructose and Glucose, both of which are quick-release simple sugars that are rapidly absorbed by the body. Carborade also contains Maltodextrin, which is also easily absorbed by the body but is released at a more sustained rate. This results in an immediate supply of clean energy that lasts, ensuring that you don't run out of gas while you exercise. Additionally, Carborade also contains vital electrolytes, such as Sodium, Potassium, Magnesium, and Calcium. These minerals will replace electrolytes that get eliminated along with your sweat, ensuring excellent muscle function and preventing the onset of weakness and dehydration. All you need to do is mix 1 scoop of Carborade with 300ml of water, and you are all set! Keep your energy levels high prior to, during, and after exercise with a delicious serving of FA Nutrition Carborade! Have a question about Carborade? What is it, what does it do, how and when to use or something else? Ask us. Mix 1 scoop of powder (30 g) with 300 ml of water. Drink 2-3 portions daily (before, during or/and after exercise). WARNINGS Carborade : Do not use if you are allergic to any ingredient in this product. Do not exceed the recommended daily dosage. Food supplements should not be used as a substitute for a varied and balanced diet and healthy lifestyle. Keep out of reach of children. Store in a cool, dry place at room temperature. Protect from direct sunlight.